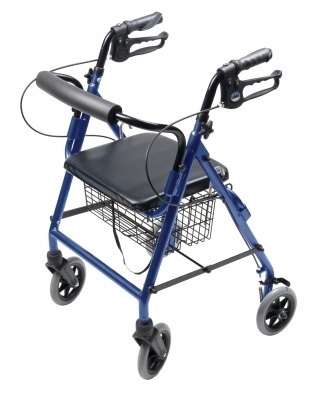 The Lumex Walkabout Four-Wheel Hemi rollator is similar to the Walkabout Lite as it also offers a comfortable, lightweight and affordable solution to mobility. The Walkabout Hemi is ideal for the more petite or shorter individual. Designed with an aluminum frame, this lightweight rollator weighs 14 lbs and supports up to a 300 lb weight capacity. The Walkabout folds quickly and easily into a compact unit for storage and transport.